A unique approach to creating Holmes pastiche by David Marcum. Published in three volumes. A collected edition was released in 2016. In 1893, Dr. Watson and Conan Doyle published what they believed was the last Sherlock Holmes story, 'The Final Problem'. The world was stunned, and The Strand Magazine rushed to fill the vacuum. Readers were soon introduced to a new detective, Martin Hewitt, as presented by Arthur Morrison. Although initially different than Holmes, Hewitt also showed a number of interesting similarities as well . . . .
For many years, Martin Hewitt has been mostly forgotten, except in some Sherlockian circles, where it has long been theorized that he was a young Mycroft Holmes. 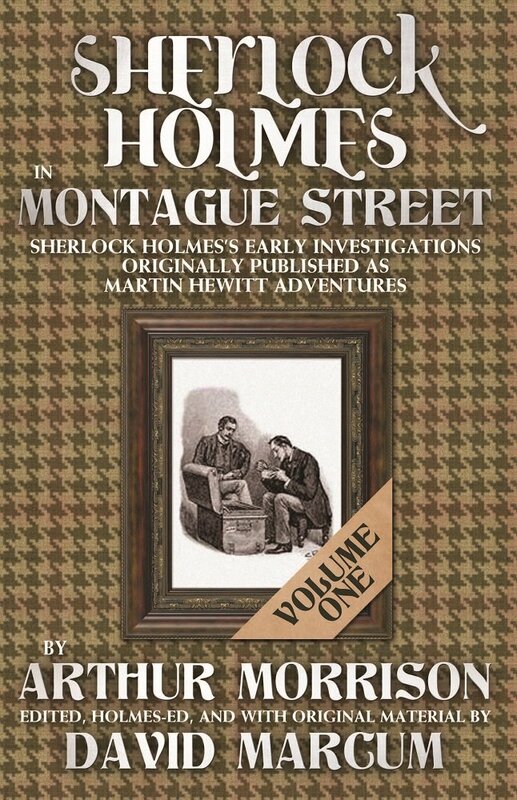 However, recent evidence has come to light that Hewitt's adventures were in fact cases undertaken by a young Sherlock Holmes when he lived in Montague Street, several years before he would take up his legendary rooms in Baker Street with Watson. These volumes are the Complete Martin Hewitt Stories, taking Arthur Morrison's original publications and presenting them as Sherlock Holmes adventures. If you are a fan of Holmes, enjoy! And by all means, seek out the original Hewitt stories and enjoy them as well. The Game is afoot!